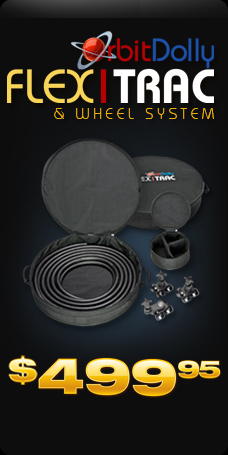 Portable tripod dolly, ideal & affordable for all videographers and filmmakers. No more straight or curved tracks for dynamic shots! 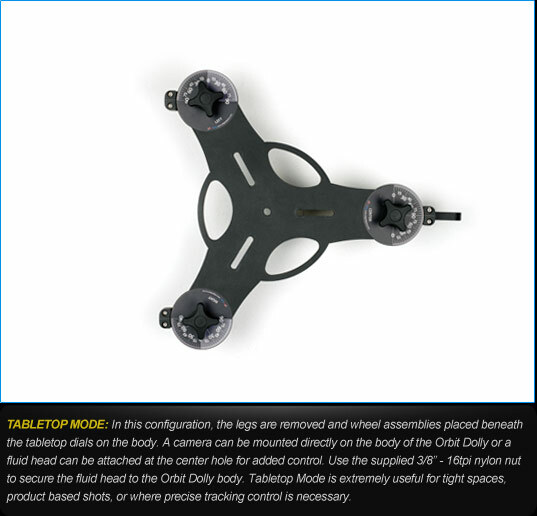 THE ORBIT DOLLY is a unique and affordable camera tracking device that allows up to 360 degrees of adjustable, smooth, radial and straight line dolly motion on smooth surfaces for photographers and videographers. This portable dolly is designed to be used both with and without a tripod and can be used in tabletop, normal and wide modes.With the lightweight, yet high quality Orbit Dolly, photographers can rotate around your subject at two feet away from the camera -- or 12 feet -- while still keeping your camera pointed toward the subject. This reliable dolly replaces the need for more costly straight AND curved tracks. It also quickly converts from a robust floor dolly to a tabletop tracker, providing added versatility and maneuverability in an affordable package. Weighing just 22 pounds, the Orbit Dolly is constructed from 1/2 inch aluminum plate chosen for its lightness, rigidity and durability. It is finished with an industrial, matte black powder coating for added protection and prevention of unwanted reflections. Setup and breakdown of the Orbit Dolly is extremely easy and the modular way it is constructed makes it compact and portable. Just loosen a few knobs, adjust the legs and the space required to store or transport this compact dolly becomes nominal. every time. NO TRACKS REQUIRED! 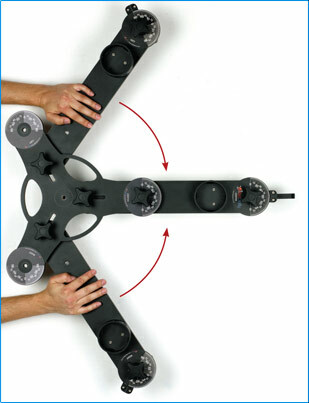 The dials on the 3 legs of the Orbit Dolly have been set up for easy adjustment between arc and straight movements. 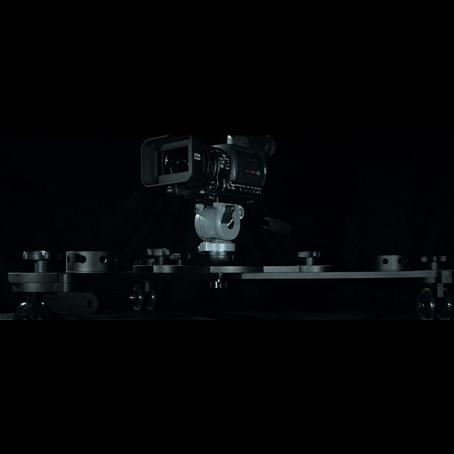 To set the dolly up for a prescribed arc, you first need to determine the desired radius of the shot from the subject. 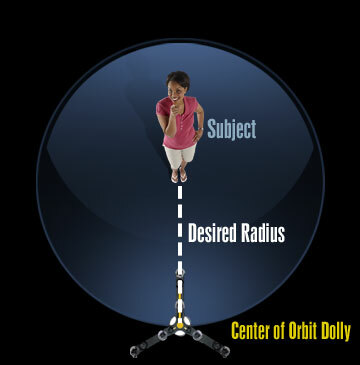 Using this distance from the center of the Orbit Dolly to the subject, you can then use the QUICK DIAL SETTING TABLES to look up the exact wheel settings needed for the left and right wheels to get the desired shooting arc. These tables are available in the provided printed or PDF User's Guide, but you can also use our handy ORBIT DOLLY WEB CALCULATOR. This calculator will soon also be available as an iPhone app. Main body components are constructed from 1/2 inch aluminum plate, precision cut using a CNC water jet technique. Converts easily between Normal, Wide and Tabletop Modes with simple knob adjustments and rearrangement of the extendable legs. 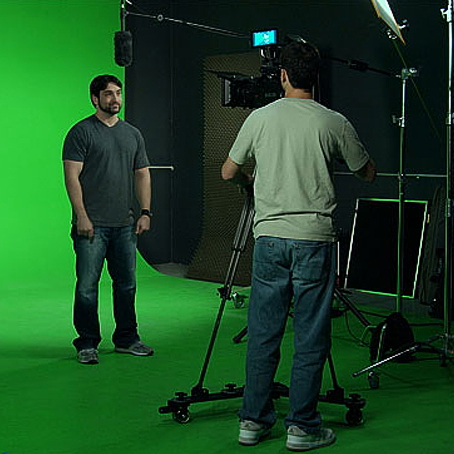 Storing or transporting the Orbit Dolly requires minimal space when the unit is adjusted to its smallest size. 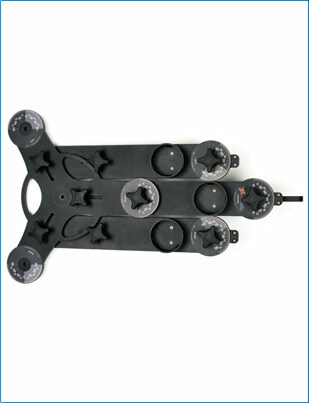 The industrial finish on the Orbit Dolly's components prevents undesirable reflections and provides added protection. Get better shots when you can shoot dolly shots in either a full circular motion, straight line or in a custom arc on any smooth surface. 3-inch urethane wheels with high quality bearings for smooth long-lasting performance. Dials have been set up for easy adjustment between arc and straight movements. 1. Arrange the CENTER leg to NORMAL Mode by removing the center knob and loosening the bottom knob in the slot so that it slides toward the center body hole. Insert knob through the tabletop dial and tighten both knobs. 2. Remove the LEFT and RIGHT center knobs from the tabletop dials and loosen the LEFT and RIGHT knobs in the slots on the body. 3. Rotate the LEFT and RIGHT legs around to position next to the CENTER leg. 4. Tighten the LEFT and RIGHT knobs to lock in place. Insert the remaining knobs into the 3/8 - 16 open holes in the body for storage. 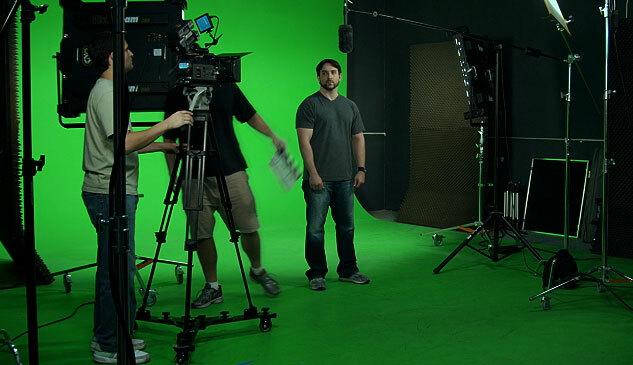 Above: Shooting smooth radial shots with the Orbit Dolly on the DJ green screen set. Left: When you need a wide radial motion shot in a larger area, a full size tripod fits right into the Orbit Dolly's leg baskets . Above, Right: For low angle or tabletop tracking shots, the compact size of the Orbit Dolly in tabletop mode is ideal (above). For these applications, you can mount your camera directly to the dolly without the full size tripod to get in the way. DIMENSIONS: 5 7/8" H x 18 1/16" W x 16 3/16" D (Tabletop), 6 3/8" H x 37 7/16" W x 33" D (Normal), 6 3/8" H x 40 7/8" W x 36" D (Wide). Height measurement is taken from floor to top of knob. Radius: 10 1/8" (Tabletop); 21 1/4" (Normal); 23 1/4 (Wide). Radius measurement is taken from center hole to outer edge of dials. 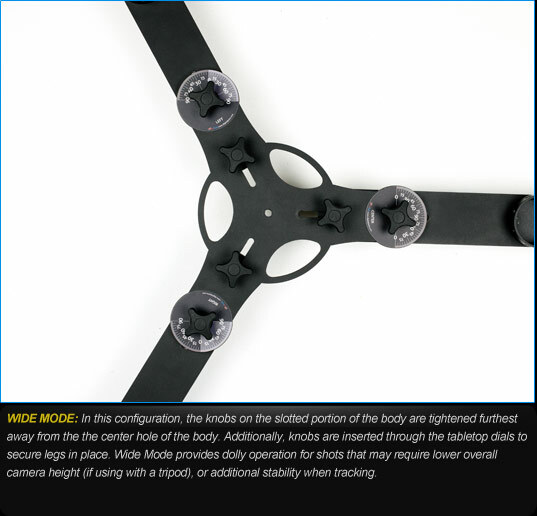 MATERIAL: Body Components -- 1/2 inch aluminum plate (series 6061), industrial matte black powder coating; Wheels -- 76mm (3 in) urethane 80a type with ABEC 7 high quality bearings; Knobs -- 3/8" - 16tpi x 1 inch bolts with nylon handles. What is the weight limit on the Orbit Dolly? The Orbit Dolly is rated to hold up to 300 pounds. What is the best way to secure a tripod to the Orbit Dolly? Secure the tripod by using (3) high quality bungee cords (customer supplied) wrapped around the top of the legs and secured to the leg baskets on the Orbit Dolly legs. My dolly has moved its position after several tracking attempts. Is this normal? Yes, it is a common characteristic on trackless dollies to experience a slight amount of "drift". It is best to use colored tape to mark (spike) intervals along the desired tracking path of the dolly. 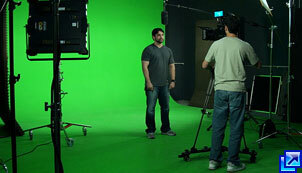 It is then easier to detect when the dolly has drifted off the set path. What makes the Orbit Dolly diferent from a regular dolly? The Orbit Dolly, unlike traditional dollies, can be used to perform repeatable, user-defined arc movements as well as specifically straight tracking movements. What is the purpose of the shaded regions on the dials found on the left and right legs of the Orbit Dolly? The color coded regions found on the left and right legs are designed to serve as a visual reference when positioning the wheels and should be used in conjunction with the QUICK DIAL SETTINGS tables for accuracy. 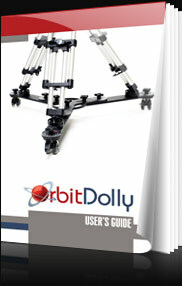 Detailed information on setting up and adjusting your orbit dolly for every shot. Includes the Quick Dial Settings Tables. Instead of looking settings up in a table, just enter your shot parameters into this handy online utility and the calculator tells what the required wheel settings are for your Orbit Dolly. Set the dials and get a perfect arc every time. NO TRACKS REQUIRED! Durable lightweight construction Main body components are constructed from 1/2 inch aluminum plate, precision cut using a CNC water jet technique. Highly versatile Converts easily between Normal, Wide and Tabletop Modes with simple knob adjustments and rearrangement of the extendable legs. Compact and portable Storing or transporting the Orbit Dolly requires minimal space when the unit is adjusted to its smallest size. 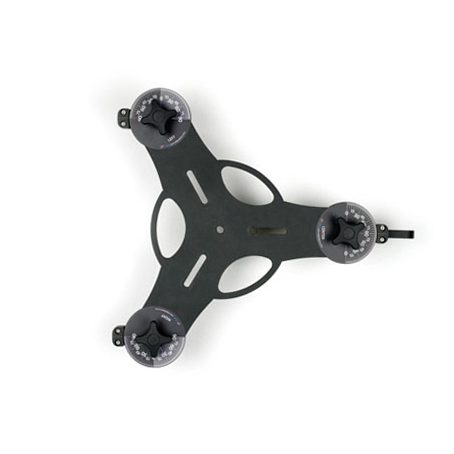 Matte black powder coating The industrial finish on the Orbit Dolly's components prevents undesirable reflections and provides added protection. 360 degree rotation Get better shots when you can shoot dolly shots in either a full circular motion, straight line or in a custom arc on any smooth surface. - 3-inch urethane wheels with high quality bearings for smooth long-lasting performance. - Dials have been set up for easy adjustment between arc and straight movements. DIMENSIONS 5 7/8" H x 18 1/16" W x 16 3/16" D (Tabletop), 6 3/8" H x 37 7/16" W x 33" D (Normal), 6 3/8" H x 40 7/8" W x 36" D (Wide). Height measurement is taken from floor to top of knob. Radius: 10 1/8" (Tabletop); 21 1/4" (Normal); 23 1/4 (Wide). Radius measurement is taken from center hole to outer edge of dials. MATERIAL Body Components -- 1/2 inch aluminum plate (series 6061), industrial matte black powder coating; Wheels -- 76mm (3 in) urethane 80a type with ABEC 7 high quality bearings; Knobs -- 3/8" - 16tpi x 1 inch bolts with nylon handles. 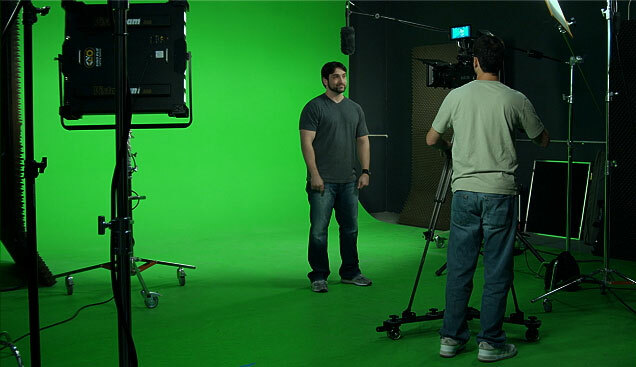 Shooting smooth radial shots with the Orbit Dolly on the DJ green screen set. 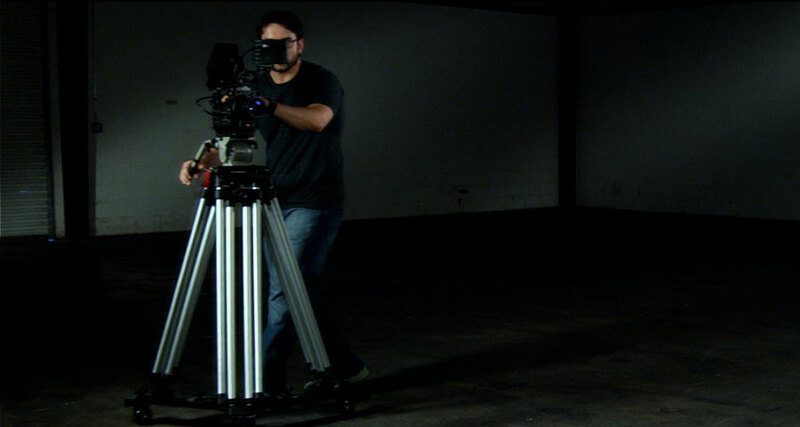 For low angle or tabletop tracking shots, the compact size of the Orbit Dolly in tabletop mode is ideal (above). For these applications, you can mount your camera directly to the dolly without the full size tripod to get in the way. When you need a wide radial motion shot in a larger area, a full size tripod fits right into the Orbit Dolly's leg baskets.